New construction accommodates the growing parish in Izbet al Nakhl, Egypt. Read about why some Christians are experiencing Anxiety in Cairo in the March 2017 edition of ONE. A Russian woman weeps as she lays flowers at a memorial 4 April in Moscow in memory of victims of a bomb blast the previous day in St. Petersburg. The metro attack, which killed at least 11 people and wounded dozens more, was carried out by a suicide bomber, said Russian officials. The first three refugee families from Syria welcomed by the Vatican left their temporary homes to start their new lives in Italy, and three new families took their places in Vatican apartments. The papal Almoner’s Office, which helps coordinate Pope Francis’ acts of charity, announced on 2 April that two Christian families and one Muslim family moved the apartments that housed the first refugee families welcomed by the Vatican in late 2015 and early 2016. The two Christian families, the papal almoner’s office said, arrived in March after “suffering kidnapping and discrimination” because of their faith. “The first family is composed of a mother with two adolescent children, a grandmother, an aunt and another Syrian woman who lives with them,” the office said. The second family is a young couple, who had their first child — a daughter named Stella — shortly after moving into the Vatican apartment, the Almoner’s Office said. The third family — a mother, father and two children — arrived in Italy in February 2016, the office said. The children have been attending elementary school in Italy while the mother has been attending graduate courses and currently has an internship. The Vatican welcomed the refugee families after an appeal made by Pope Francis on 6 September 2015, in which he called on every parish, religious community, monastery and shrine in Europe to take in a family of refugees, given the ongoing crisis of people fleeing from war and poverty. Archbishop Konrad Krajewski, the papal almoner, said that aside from providing a home for the three families, the office also continues to provide financial support to the three Syrian families whom Pope Francis brought to Italy after his visit last year to the Greek island of Lesbos and for the nine additional refugees who arrived later. 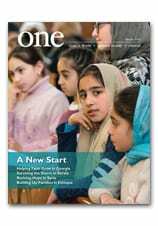 We’re pleased to announce that the new edition of ONE is now available online —and headed to a mailbox near you. Among other things, the March edition features a Letter from Ethiopia, written by Abune Tesfaselassie Medhin, the bishop for the Ethiopian Catholic Eparchy of Adigrat; a poignant glimpse at efforts at Breaking the Cycle of addiction and abuse, to help children in Kerala; and a dramatic report on The Displaced of Ukraine, struggling to start over after a devastating war. For more, check out the video below, from CNEWA president Msgr. John E. Kozar, who offers a preview of what’s in ONE. You can find the whole March 2017 edition online at this link. Yesterday, our last and most time-intensive day here in Lebanon, began as all of our days have, in the traffic-choked Beirut rush hour. But this morning, we were in for a dramatic change of scenery as we headed east over the mountains and into the Bekaa Valley. The fertile, flat landscape is where the majority of Lebanon’s 1.5 million Syrian refugees reside and where, in some villages, they outnumber the native population. From deep in the valley, you can see the last mountain of Lebanon and see a guard post where Syria begins. Accompanied by our Beirut regional director, Michel Constantin, and programs manager, Kamal Abdel Nour, our first stop was the Community Center of the Good Shepherd Sisters in Deir-al-Ahmar, run by Sister Amira Tabel. Over Lebanese coffee (which has become a standard of all of our program visits) she explained the center’s multifaceted, holistic approach to the Christian and Muslim Syrian refugee population it serves. “If a child asks what a nun is,” she told us, “I explain that a nun is someone who loves and serves everyone and doesn’t distinguish between their nationality or religion or anything else.” In addition to education following the Lebanese curriculum, the center also offers vocational training to young men and women and psycho-social training to parents and children. She has also worked to build a culture of peace and understanding, ensuring that the teachers are trained by social workers to utilize positive reinforcement to encourage every student. Hearing Sister Amira describe her efforts was awe-inspiring. To ensure that children weren’t exploited by local farmers, she added classes to keep the kids at the school for longer hours. In another instance, Sister used cultural opportunities — such as how to remove henna — as a health lesson on how to wash hands. And when a student stopped coming to class for several days after a bad grade on a quiz, Sister invited the mother to sewing classes to encourage the family to remain involved in the school. A student takes a break during his studies at the Good Shepherd social center. We were able to visit a few classes and saw firsthand how Sister Amira’s ideals have been put into action. Students of all ages warmly greeted us in English, Arabic and French — all of which are taught in the Lebanese curriculum. Their commitment to their education is a commitment to the future of Lebanon. It’s no surprise that the Fratelli Association we visited on our first day modeled their work in southern Lebanon after the Good Shepherd Sisters. After a delicious lunch with Bishop Hanna Rahme of the Maronite Catholic Eparchy of Baalbek-Deir El Ahmar, and with much more to see in the region, we ventured south to the city of Zahle, the economic center of the valley. There, we visited a Syrian refugee camp supported by CNEWA through the local Melkite eparchy. Over the last year, we’ve provided heating supplies and hygiene kits to over 1,200 refugee families, both Muslim and Christian. The warm welcome we received was overwhelming. The residents, who have been there since 2012, were quick to show us their tents, with makeshift kitchens and sleeping quarters. Children, most of whom have never known any other lifestyle, joyfully ran among the alleys — while oblivious to the omnipresent tripping hazards. Women and girls gathered scallions from a nearby garden. A few men sat sipping cups of afternoon tea before resuming work on a concrete walkway, a vast improvement over the gravel that quickly turns muddy in the rain. With the help of the local church, families have adjusted to their new normal. While we’ve encountered joyful people throughout the week, here we saw the most resilient. Saying several goodbyes to new friends of all ages, we drove up narrow lanes and steep hills to a diminutive apartment shared by two Catholic families from Homs, Syria. They clutched the rosaries around their necks as they explained that they had left behind everything amid the destruction of the city. The fathers are desperately seeking employment, and one explained that his wife is expecting a child. Through the work of the archdiocese, these families cannot be left behind. After a long day, we climbed the mountain again in time to see the sun setting over the Mediterranean. We pray in a special way for the families we met, hoping that each day dawns brighter than the last. Given the good work we’ve seen today, we know it will. Ahlam Ibrahim, a displaced Chaldean Catholic, fled from Tesqopa in 2014. Although ISIS was driven from her home late last year, she continues to rent a small apartment in Sharafiya. “If the mobile clinic didn’t come here, we wouldn’t have medicines, because none of us can afford to buy them from a pharmacy,” Ms. Ibrahim says. “We are far from the fields where we can earn our living, and most of what we have goes into paying the rent every month. The mobile clinic, a lifeline to many, is one of many initiatives of the Christian Aid Program Nohadra-Iraq (CAPNI), an organization based in Dohuk. Since 2014, CAPNI — which CNEWA helps suppport with funds — has focused on responding to the humanitarian crisis generated by ISIS. The Rev. Emanuel Youkhana is an archimandrite of the Church of the East and the executive director of CAPNI. He previously served congregations in the Dohuk area destroyed by the government of President Saddam Hussein in the 1980’s — including many displaced members. When Kurds of the region rose against the government in 1991, Abuna Emanuel became a spokesperson for the local Christian population, helping journalists and church leaders from abroad to understand the plight of religious minorities. As a result, President Hussein blacklisted him, and in 1994 a grenade was thrown into his family’s home. No one was injured, but Abuna Emanuel responded by moving his family to Germany. For most of the year, however, he remains in Iraq. Read the whole story and see more pictures here.